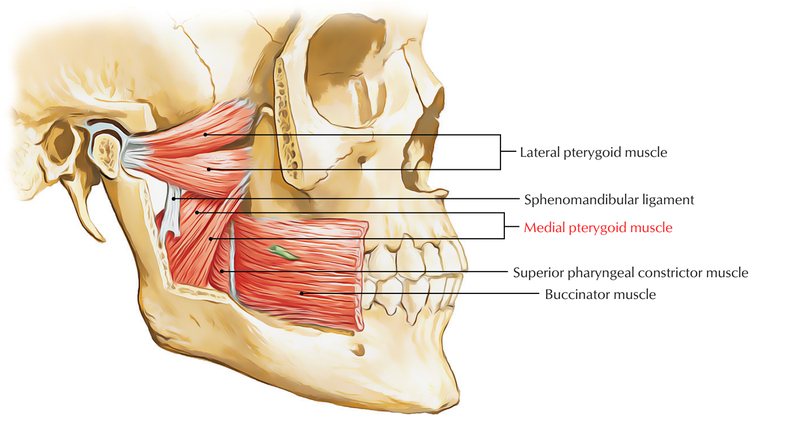 The medial pterygoid is a dense quadrilateral muscle and is made up of two heads: superficial as well as deep. The small superficial head is a small strip of muscle that emerges from maxillary tuberosity as well as lateral side of the pyramidal process of palatine bone. The large deep head creates the bulk of muscle and emerges from medial side of the lateral pterygoid plate and grooved side of the pyramidal process of palatine bone. In order to be inserted into a rough zone, the fibres travel inferiorly, posteriorly, as well as laterally via a strong tendinous lamina on the posteroinferior portion of the medial surface along with angle of ramus of mandible higher till the mandibular foramen and forwards till the mylohyoid groove. The medial pterygoid is innervated via a nerve towards medial pterygoid, which is a division from the main trunk of the mandibular nerve. Levator palati and tensor palati muscles. In order to help in closing of mouth, medial pterygoids of two sides elevate the mandible. The corresponding side of the mandible is rotated forwards and towards the opposite side when medial and lateral pterygoids of one side act together. Lateral and medial pterygoids of two sides when constrict consecutively they create side-to-side movements, which help in pulverizing the food.